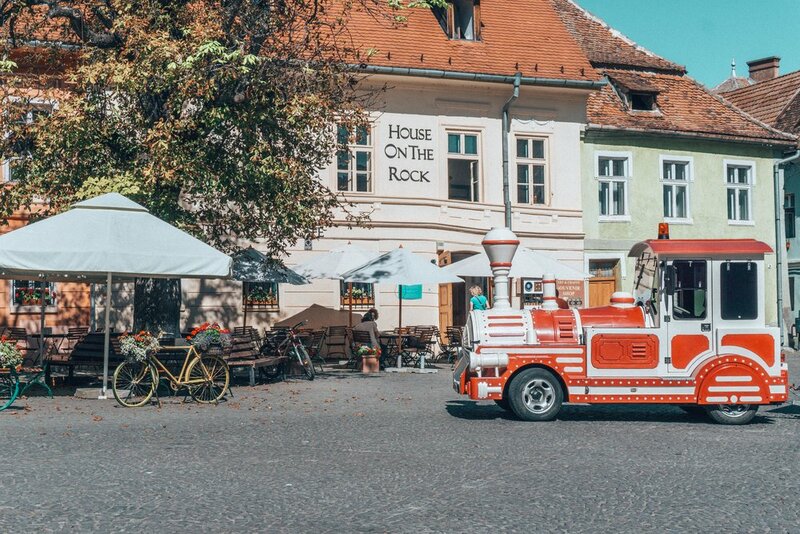 I have to say, even though I’m Romanian and visited Sighisoara lots of times until now, whenever I am in this old citadel I feel happy and amazed by all the vibrantly colored buildings, the chill atmosphere and the delicious Transylvanian cuisine. 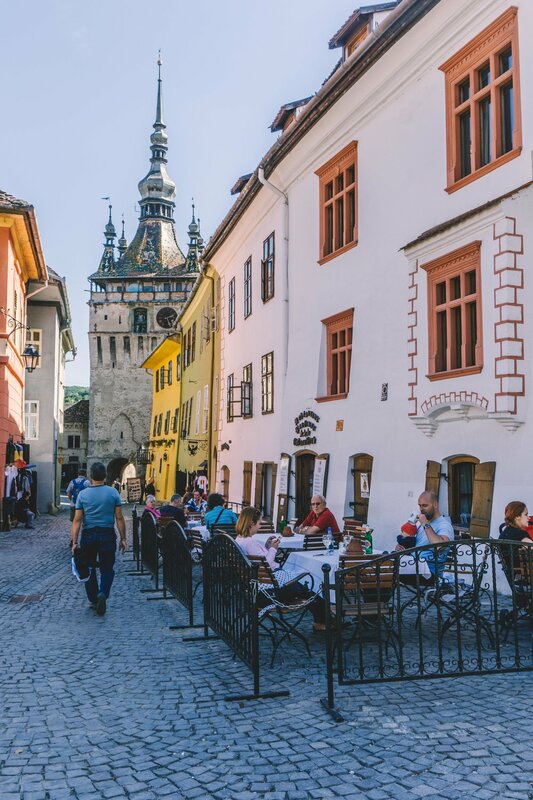 Sighisoara's hilly cobbled streets, colorful medieval buildings, steep stairways, stone defensive towers and little squares make it a delightfully photogenic and fascinating place to stroll. It happened again on this late summer visit. My cousin decided to show her Portuguese husband the beauty of her own country. So we toured around Transylvania, from mountaintops, to old villages and medieval cities. On a Friday evening the road brought us to Sighisoara. After parking the car at the base of the citadel, we climbed the stairs winding through the forest that lead up to the fortress. When we stepped foot on the old cobblestones it was like entering a fantasy world. So much silence, color and beauty, wish you were there to experience it all! We were lucky to skip the weekend tourists and had the city almost to ourselves. A big part of Sighisoara’s charm comes from the mix of cultures. Back in 1191 the King of Hungary invited German craftsmen and merchants to settle and defend this old Roman fortress. They turned it into a strong defensive construction, with towers overlooking the valley and a 14th century clock tower, which was controlling the main gateway and walls. Out of the 14 original towers, nine are still intact, along with two bastions. Another history “gossip” which attracts visitors is Vlad the Impaler, also know as Dracula due to Bram Stoker’s novel. His father lived in a three-storey house back in 1431 for two years. 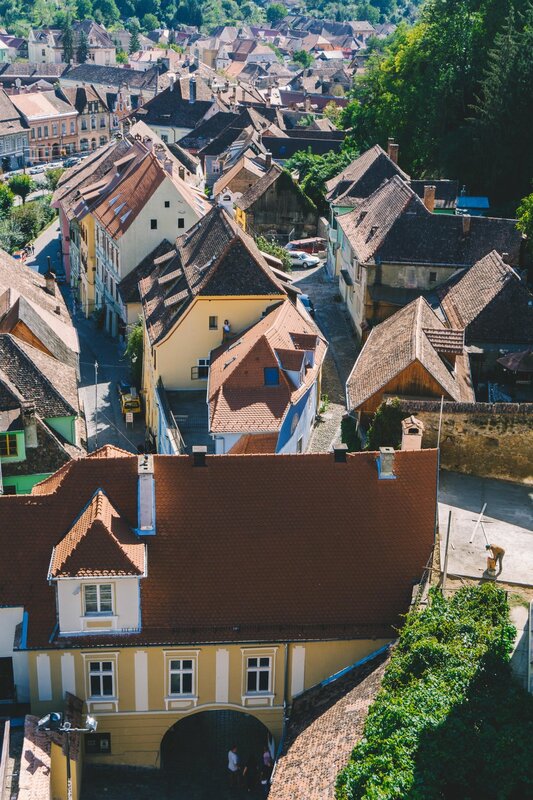 You cannot truly get lost in Sighisoara, because its tiny streets will always lead to the main squares. So just drop the maps and don’t ask for directions. When you see an interesting building, go to it and admire its carefully designed details. If you hear the bells ringing, follow them, they will probably take you to your next photo location. 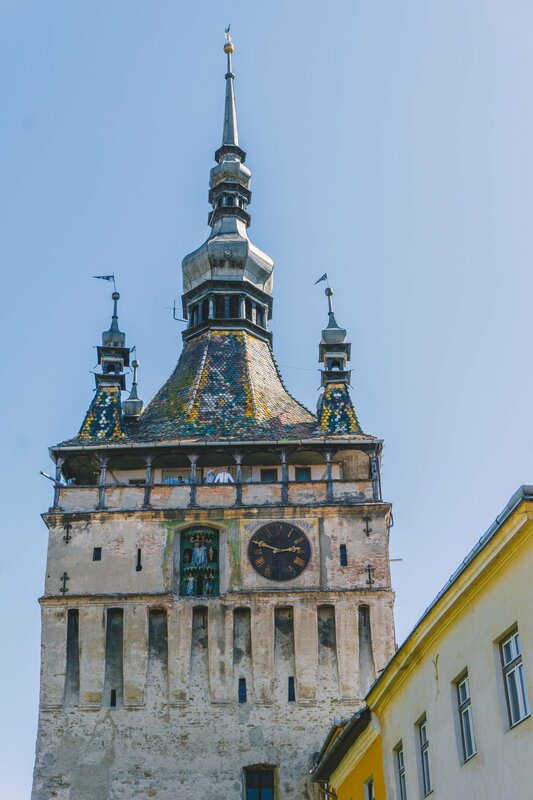 This is the most famous and most visible, of Sighisoara’s nine remaining defensive towers. 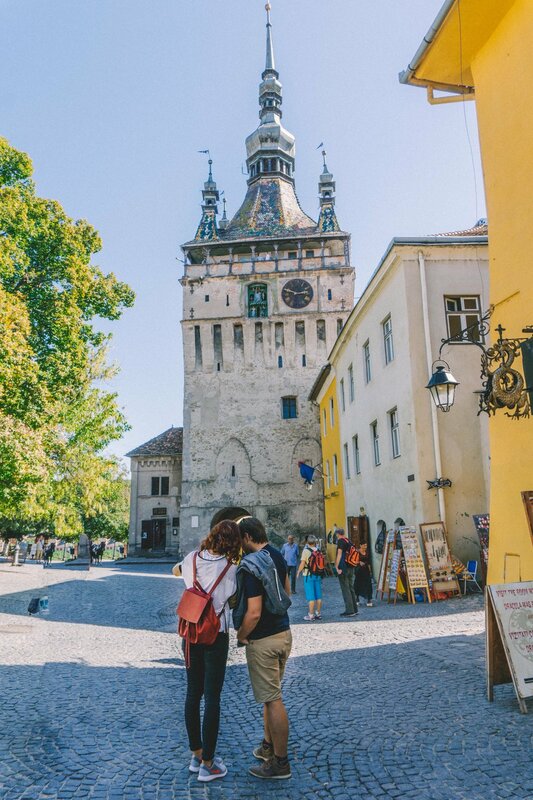 After paying a symbolic entrance fee, you can climb up the narrow staircase that will take you first to the history museum, which tells you all about Sighisoara with artefacts from its past and then to the highest viewing point of the citadel. You will observe the 1648 clock, with its seven different slow-moving figurines. These replace each other when midnight strikes. There are two main squares in Sighisoara – Piata Cetatii and Piata Muzeului. These are packed with traditional restaurants, street stalls and shops. If you need a break to enjoy some drinks and watch the people pass by, then head over to one of the colorful squares and choose a terrace. If you regained your energy, head over to the Scholars’Stairs, a wooden tunnel containing 175 steps dating from 1654. It was built for the students who still scale it to attend classes at the school on top of the hill. Next to the school, you will see the gothic style Church on the Hill, built at a height of 429 meters. After enjoying the view, if you feel adventurous, go down through the cemetery. While looking at the bright yellow building, you wouldn’t imagine that this was the home of Vlad Dracul, the father of Vlad (the Impaler) Tepes, who is better know as Dracula. This house may be the oldest in the area enclosed by the citadel, as it survived the 1676 fire. If you are a fan of Bram Stoker's character, you'll find plenty of souvenirs in Sighisoara. Also, the famous Bran Castle is just a couple of hours driving. Bean soup is one of the core foods in Romanian cuisine, especially in Transylvania region. If you are curious to taste more authentic dishes, try the cabbage rolls, grilled sausages, eggplant paste or even polenta with cheese. Did you ever visit such a colorful medieval city? I would love to get some more travel inspiration in the comments section below.